This is a Jewish treat! 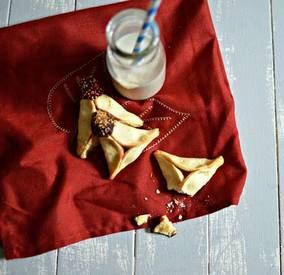 Have you ever made hamantashen before? One of the reasons we eat them on Purim is because they are said to resemble the triangular, 3-cornered hat that Haman wore. Trying to perfect the shape and keep the filling in might seem daunting, but I’m going to break it down for you with step-by-step pictures to make it easier.